The blonde girl with plaited pigtails comes up to my waist, her arm stretched out, holding a glistening lollypop the size of her head. She is a walking cliché plucked from a nearby advertisement. Almost. I expected pink ribbons or a teddy bear, something to complement her sweet voice to complement her sweet lolly. I look around the platform, someone to take ownership of their genes, during which time my mouth opens a fraction and my brain starts to stammer. I see suits. I see rings. I see shoes that tap, shoes that squeak. I see briefcases. I see bags. I see other things tucked under arms. I see wet hair. I see scarves. I see beanies. I see a beanie with a felt bird perched on top. I see pigeon crap. I see billboards. I see puffy eyes, empty stares. I see iPhones. I see headphones. I see an apple. 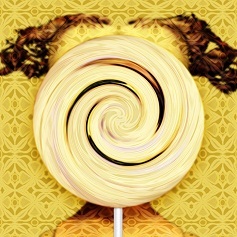 I see a lollypop. I look beyond the tracks, pretend to count the number of utes with ladders in the back. There is a little girl staring at me. The girl’s mother intervenes with a glossy smile, with messy hair that won’t tie back. The mother smiles again, bends over to rub the corner of her daughter’s mouth, doesn’t seem to realise she is showing the top of her black bra. I scratch the top of my head, where my hair ties back. She reveals more of her black bra. Don’t seek acceptance from strangers? At this time of the morning my faded jeans with authentic knee holes seem inappropriate for the train. I fiddle with the piece of leather choking my wrist. There is probably a Centrelink nearby and I continue to fiddle. I can hear occasional words like ‘appointment’ and ‘budget’ and ‘assignment’; people are gravitating towards patches of yellow light. The morning sun is tender but in the shadows coldness chills the bones. Waiting passengers seek out the warmth, not wanting to get too close to others, knowing that ‘The next train to arrive on Platform Three goes to City Circle. First stop, Lidcombe…’ will squish them together for at least 40 minutes. I should have at least been carrying a newspaper. The mother stands up and straightens her top, brushes strings of hair behind her small ears. She takes her daughter’s sticky hand and says something to me and something else, the little girl waving at me with her other hand, with her lollypop. When the girl boards the train with her mother, she skips between the anxious flock of passengers. Almost a walking cliché. The doors close with a hush and I see the mother look over her shoulder to gauge her womanly appeal, her glossy lips, black bra. I stand still with cold knees. I am thinking how nice it was to be called a man. that snake across her face. the soldier or his news. that regularly erupted on the News. but you knew they were somewhere underneath. and think how tough it was. How strong. and withstood the sun even after the old tree had gone. I remember how as kids that grass had hurt. and am the stock of a resilient lawn.